The International League festivities continue this week with a cap from a team whose city has a history of hosting professional baseball that goes as far back as the origin of the league itself which was founded in 1884 while a year earlier, the Toledo Blue Stockings was an inaugural member of the Northwestern League which was all teams from the midwest. 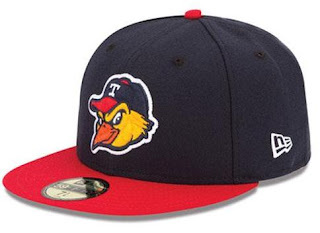 They later became the Toledo Mud Hens in 1902 when they joined the American Association, which was an independent league that later jumped up to Double-A in 1912. The team then got another promotion when the American Association became a Triple-A league in 1946 and stayed at that level when they joined the International League in 1965. 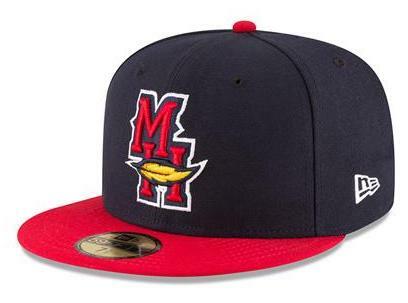 To me this cap is synonymous with my appreciation of the International League as it was the cap the Mud Hens wore when I started going to games almost 30 years ago. The fact that the team still wears this cap is a testament to its longevity. The sweatband tags and satin taping are typical of caps from 2002-2004 so I'm going to stick with that range as to what year this cap was worn. As much as I love it when teams honor their past, I can't deny them the right to keep up with current trends when they spice it up with fun road and alternate hats. Pictured above are the current road cap (left) and alternate cap (right). This week's cap is a size 7 1/4 which means it will be going on the Trading Block so please don't hesitate to reach out if you want this or any other cap from that list and you are willing to part with any of the hats on my Wish List.